The following is a guest post from Mitch Stevens, Sierra Club hiking leader and founder/lead guide of Southwest Discoveries. Based out of Tucson, Arizona, Southwest Discoveries offers multi-generational guided tours of the Grand Canyon, Sedona, Horseshoe Bend, the Tortolita Mountains, and more. Visit Southwest Discoveries for more information. The snow-cat rumbled to a stop amidst the barren rock and snow fields on Mount Hood, Oregon’s iconic summit at 11,250 feet. It was an eerie sensation to be grinding along in pre-dawn blackness; we had to start our journey at 12:30 am to avoid melting snow and ice-fall near the summit. Bundled up against the chill, it was hard to believe that Portland, more than 8,000 feet below in the Willamette Valley, would be baking in 100 degree heat on this late June day. Many thoughts raced through my mind during the forty-five minute ride. My hiking buddy Bill Bens murmured, “Did I bite off more than I could chew?” while sitting across from me on the snow-cat. Bill and I were signed up for the summit program on Mt. Hood, the first time either of us had attempted such a feat. 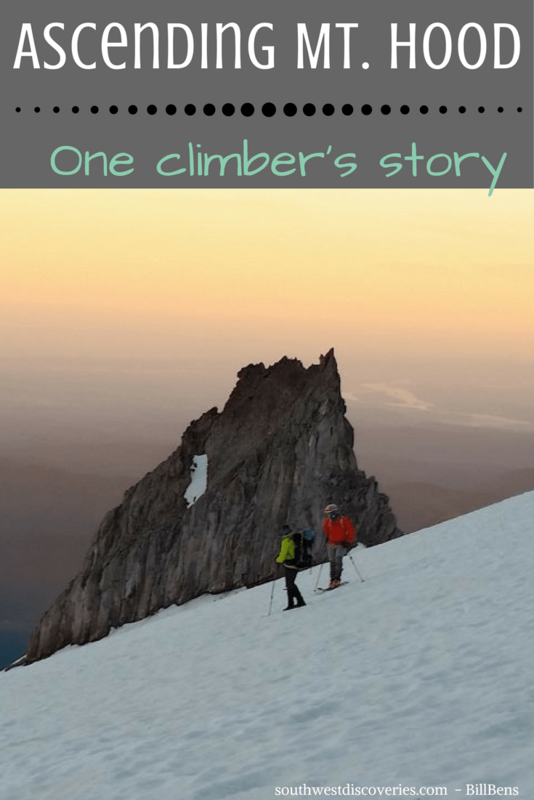 Although we were experienced hikers (Bill attends many of my Sierra Club outings), climbing a technical peak navigating snow and ice was an entirely different undertaking. 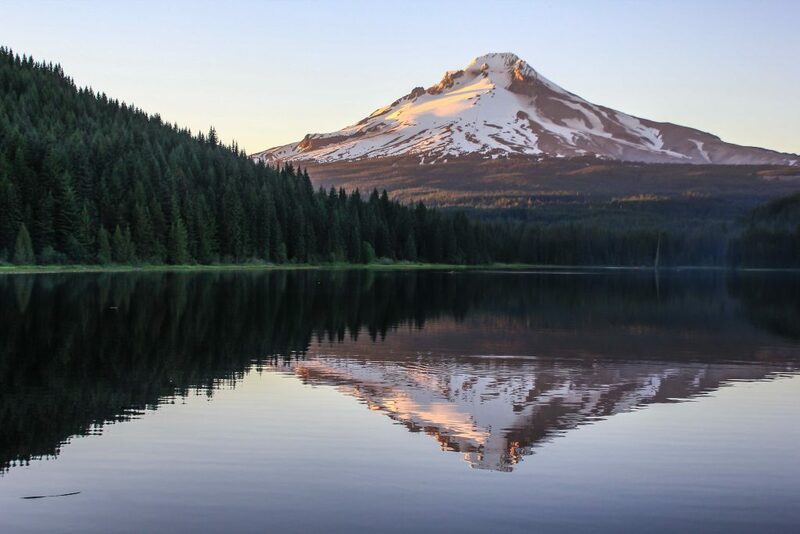 Mount Hood was on our collective radar screens for quite some time so we booked this trip, intent on accomplishing the deed. My feet still hurt from the “snow school” course the day before. Our instructor Phil, a guide at Timberline Mountain Guides, taught us steep snow climbing techniques, technical rope work, and self-arrest. It was recommended we rent mountaineering boots, crampons, helmets, harnesses, and ice axes. The boots, made of plastic, proved to be uncomfortable, causing painful blisters. Because of a life-long condition of bunions, this was a major cause of concern on my part. Phil, exhibiting the manner of a Marine’s drill commander, displayed no empathy. After the skills course, we had little time to rest before our Sunday morning lift-off time. Bill and I managed less than two hours of sleep each – not a good way to begin a strenuous climb in the dark, on an icy and sometimes dangerous mountain. 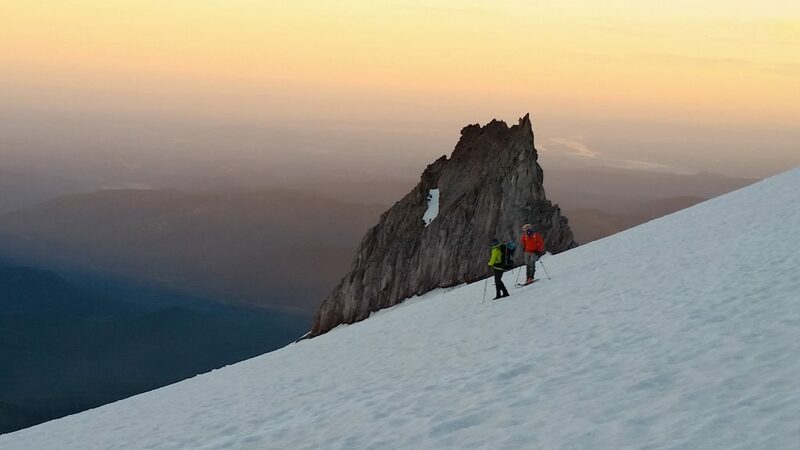 As of May 2002, more than 130 people have died climbing Mount Hood since records have been kept. Another concern was unseasonably warm conditions, good from the perspective of comfort but bad because the snowpack near the top of the peak must be frozen to minimize the risk of falling rock and ice. The guides from the day before had mentioned that we may not be able to summit the mountain for this reason. We got off the snow-cat and began climbing in pitch black conditions. Only the lights from our headlamps illuminated the night. The climb was steep, relentless, and tedious with my feet growing increasingly painful. Phil queried me, “Did you forget everything you learned at snow school yesterday?” He didn’t like the way I was striking the snow with my aching feet. The man assumed I was an experienced mountaineer; he had little patience. An hour later we donned crampons as the snow became firmer. At the Hogback, approximately 700 feet below the summit, we heard ice and rock careening down from the high peaks, confirming that the snow-pack was unstable. We took a break there as the guides assessed the situation. It was decided to abort the climb. We still had to descend 4,500 feet back to Timberline Lodge, a historic and fascinating old hotel that we had explored the day before. The return trek was lengthy, albeit increasing light and with warmer conditions buoying our spirits. The landscape remained incredible. Even though we were not successful in cresting Mt. Hood, the excursion was meaningful and worthwhile. I want a rematch with Mount Hood in 2018, this time with leather mountaineering boots! Summiting any mountain requires a respect for nature, patience, and practice, as we are guests on the mountain and weather will always dictate conditions. Although we all aspire to put our feet on the summit, sometimes it’s the adventure itself that brings the greatest reward. Many thanks to Mitch Stevens from Southwest Discoveries for sharing his guest post this week. Have any of you attempted or summited Mt. Hood? I’d love to hear your stories! Read more about Southwest Discoveries here!